Ben is 36 years old, married to Lauren and they have a beautiful little boy Luca, who is 18 months old. 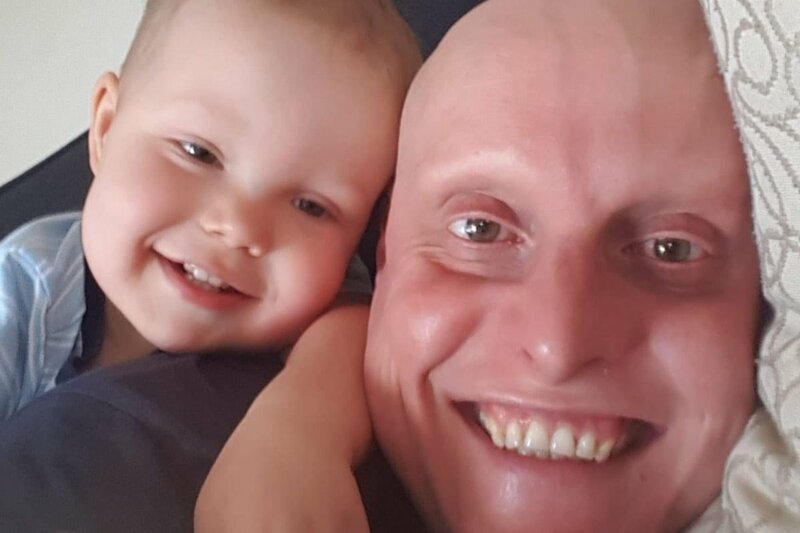 Being a Dad to Luca is Ben’s dream come true and we believe this will give him the motivation to get through the extremely difficult situation they are in. Ben was born with cardiomyopathy and congenital heart defects. At 14 months old, Ben fell seriously ill and became the youngest person in Australia (at the time) to have a pacemaker implanted. He has been on medication all his life and hospitalised many times due to his heart condition. Tragically, Ben suffered a cardiac arrest at home on 1st September 2018 and without immediate CPR by Lauren and swift attention by Paramedics, he would not have survived. Ironically, 2nd September was Ben’s birthday and his first Father’s Day. On 12th September 2018 (Luca’s first birthday), Ben underwent a lengthy operation to remove his Pacemaker and leads, which were replaced with an Implantable Cardioverter Defibrillator (ICD). In the ensuing 6 months, Ben has suffered a number of life threatening Cardiac Arrhythmia, which without the ICD, would have been fatal. These arrhythmia have had a detrimental effect on his heart and his kidneys – which recently required dialysis. Once, Ben used to play basketball and soccer, he now struggles to walk short distances. Ben is in severe heart failure and urgently needs a heart transplant. Unfortunately, for that to happen, another family will lose a loved one. Following recent tests at St Vincent’s Hospital, Ben is now formally on the waiting list for a donor heart. Ben remains in hospital waiting. Ben may have to go home to wait - we're not sure. We hope the wait will not be a long one - but there are many more people needing a new heart than there are donors. We hope he’ll get one soon, because his one wish is to see his son grow up - something many of us take for granted. Ben has now been in hospital for 4 of the last 7 months. The accommodation costs for Lauren and Luca to visit haven't been cheap, coupled with the lost income for both of them. If he is lucky enough to receive a donor heart, Ben will be in hospital for at least 10-14 days. Post-surgery, the biggest dangers are potential rejection of the new heart and infection. Ben will need his family with him. For 3 months after he leaves hospital, Ben and a full-time carer are required to reside in Sydney to attend ongoing medical appointments, tests, counselling, physio, gym, nutrition sessions etc at St Vincent’s several days per week. Lauren works part-time but she and Luca will need to visit on her days off. So including the operation, we envisage needing to rent an apartment for around 4 months. Despite having extremely supportive and generous employers, Ben and Lauren have exhausted all of their paid leave entitlements. Ben has limited insurance - he is basically uninsurable due to his heart issues since birth. 5. Enabling Ben to enjoy some special moments with Lauren and Luca and perhaps a holiday when their life returns to normal. This cause means everything to me because I’ve had 36 tough but wonderful years with my son Ben. I hope Ben has the same opportunity to see his son Luca, grow up. Your generous donation can’t buy a new heart for Ben, but it will ensure that once he receives the “gift of life”, Ben gets to spend some quality time with his family without the stress of increased debt caused by his illness. Even if you can’t afford to donate, but you think this is a worthwhile cause, could you please help get the word out by sharing the link to your Facebook timeline.